The shops below sent product for review, as always, all thoughts and opinions are 100% my own. Izzy has loved books her whole life. Being an educator I have loved reading to her. She now is started to memorize the books and call out what will happen on the next page. We could read 50 books in a row.. no joke. 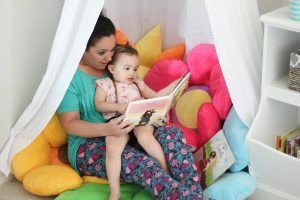 This is why I decided to make a cozy book area in her play room. We just crash on the pillows and read away. What will you need for you cozy book nook? They are super durable, comfortable and Izzy loves the bright colors and designs. You can buy the pillows separate or together as a bundle. This canopy comes in 3 colors and the quality is amazing. When you open it up, just tie the strings to the loop and hang it to the ceiling with the hook that comes with it. Super easy guys! 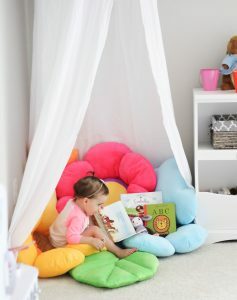 We love these Floor Bloom pillows! They are super soft, cushy and I honestly haven’t seen anything like them before. They are perfect to drag anywhere in the house! 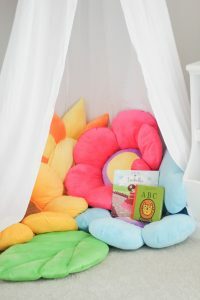 Izzy loves the bright colors and I love that we now have a comfy place to hang when reading book after book. 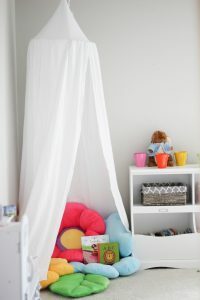 Love this nook! Those floor bloom pillows are too cute and pretty! They would look great in Avery’s room. 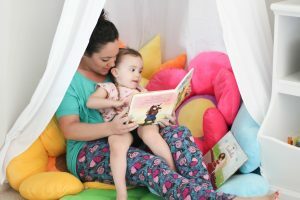 My kids have a couple of the Floor Bloom pillows and they LOVE them – we use them daily! This space is so adorable! My kids would love something like this. This really couldn’t be any cuter! Love it! This is SOOOOO cute!!!! I absolutely love it!